The exact outcome of these actions depends on various scenarios, which are described below. When a new Dossier is created from a Dossier template, it inherits all the properties of that Dossier template: Brand, Issues, Category, and any other relevant properties. Comment: "This template is used for creating Sport articles." Note that properties such as Brand, Issue and Category have been inherited while the Status property has changed to the default status for a Dossier. Properties such as Route To and Comment have been left empty. When the Dossier template is double-clicked anywhere in Content Station, the new Dossier inherits all assigned Issues of the Dossier template. 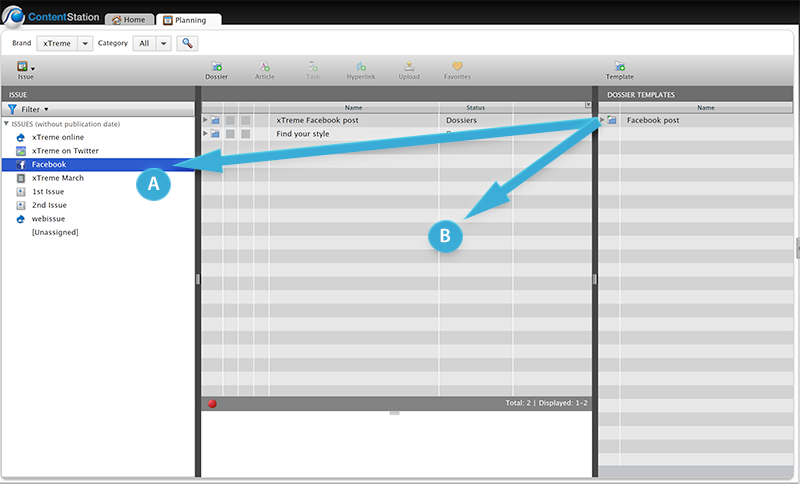 Example: A Dossier template has Issues 'A' and 'B' assigned. When double-clicking the Dossier template, the created Dossier will inherit these Issues 'A' and 'B'. Example: A Dossier template has Issues 'A' and 'B' assigned. When dropping it onto Issue 'C', the created Dossier now inherits Issue 'C'. Tip: The properties of the new Dossier can always be changed when the Properties dialog box for the new Dossier appears, or later at any stage. For Content Station versions 9.0 – 9.8.3: All files inherit the same properties as those of the files in the Dossier template. Example: A Dossier template contains an article and a Layout template which have both been assigned to Print Publication Channel 'A' and its Editions 'B' and 'C'. When the Dossier is created, the article and layout template will also be assigned to Publication Channel 'A' and Editions 'B' and 'C'. Example: A Dossier template contains an article and a layout template which have both been assigned to Category 'A'. When the Dossier is created in Category B, the article is assigned to Category 'B' while the layout template is assigned to Category 'A'. Article. A new, stand-alone file is created by duplicating the article in the Dossier template. Article template. (Behavior in Content Station 9.2.1 or higher) A link to the original article template is created. Article template. A new, stand-alone file is created that is based on the article template. Note: When only one template is present, the article is created immediately. When multiple templates are present, these are all added to the Dossier. When the new Article button is clicked in the Dossier, the user has to choose the template on which the article should be based. Layout. Layouts are ignored and will not be added to the created Dossier. Note:The reason for this is that a new layout should be created by basing it on a layout template so that the correct design and styling for that Issue is used. Layout template. A new file is created that is linked to the original file in the Dossier template. Note: Users use this template to create one or more new layouts. The link to the original file is beneficial: when a change needs to be made (such as changing a paragraph style) this then only needs to be done once and will automatically be visible in all instances of that template. Layout Module. Layout Modules are ignored and will not be added to the created Dossier. Note:The reason for this is that a new Layout Module should be created by basing it on a layout template so that the correct design and styling for that Issue is used. Task. A new, stand-alone file is created by duplicating the Task in the Dossier template. Publish Forms. A new, stand-alone file is created by duplicating the Publish Form in the Dossier template. Image. A link to the original file in the Dossier template is created. All other file types. A link to the original file in the Dossier template is created.